There are many common tests done later in pregnancy. One of the most discussed by pregnant women is the glucose tolerance test. Because of the length of time and fasting involved many women are not fond of this test. The fetal monitoring test, however, is a favorite. Listening to the heart beat of your new baby is one of the highlights of each doctors’ visit. The glucose tolerance test is important for both the mother and the child. The test is performed to check the mother for gestational diabetes. Even if the mother has no history of diabetes she could still develop gestational diabetes. This disease can affect up to four percent of all pregnant women and the cause is unknown. Gestational diabetes is detrimental to the mother and the baby. With gestational diabetes additional blood glucose can cross the placenta and increase the baby’s glucose levels as well. This will cause the baby’s pancreas to increase insulin levels to remove the additional glucose. This extra glucose is energy the baby does not need and the extra energy is turned into fat. This extra fat can lead to a large baby that may not fit through the birth canal or who may not fit without damaging himself or the mother. If the baby is too large he or she will have to be removed via cesarean section. Upon birth the baby may have breathing problems and may also have low blood glucose levels. The glucose tolerance test is one of the more time intensive tests you will experience while pregnant, but it is not difficult or painful. You will need to fast for twelve to fourteen hours before arriving at your appointment. Immediately upon arrival you will have your blood drawn to test your fasting glucose levels. You will then be given a glucose solution that you will need to drink within a short period of time. After you have ingested the solution you will be asked to wait for one hour. Then your blood will be drawn again to monitor your glucose levels. This procedure will continue for another two hours and two additional blood draws. During this time you will not be allowed to eat or drink anything other than water. You will also be encouraged to stay at the hospital or doctors’ office until the testing is completed. Because you will have to go without food for so long in order to complete this test you should bring along a snack for when you are finished. 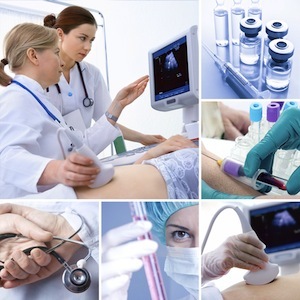 Fetal monitoring is another common and painless test. This test will be done at every doctors’ visit once the heartbeat is audible. This test can be done with a type of stethoscope or a device which is wrapped around the uterus and listens to the baby's heartbeat. The doctor or nurse will be listening to count the heartbeats of the baby and make sure the frequency and rhythm is normal. Usually the Doppler device will be placed on the stomach after a gel has been applied. The nurse or doctor will then time the baby’s heart beat and place the information in your chart. A normal heart rate is between 110-160 beats per minute and the heart rate should show "accelerations," short term increases in the average heart rate.